Green Man Gaming has launched its 2017 Year in Review report offering video game insights and trends throughout the year from millions of its customers and community members worldwide. 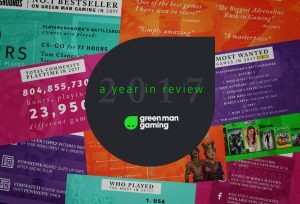 The report and infographic gives a detailed look into how the community played their favourite PC games in 2017 and what customers did on the Green Man Gaming store taking into account multiple platforms including Steam, PSN, Uplay, Nintendo, Rockstar Social Club, Origin, Battle.net and lots more. 2017 saw PLAYERUNKNOWN’S BATTLEGROUNDS top Green Man Gaming’s best sellers with owners of the game spending an average of 86 hours playing the game. Gamers in the USA had the highest game playtime in 2017 whilst the most popular game in the UK was CS:GO. The top news story of the year was Jennifer Lopez investing in e-sports. VISIT the Year in Review 2017 Blog post for all the details or READ the press release.